Welcome to Sunday, gentle readers. Time to grab some tea, kick up your feet, and lazily read my favorite reads of the week. 15 of the best Shakespeare tattoos. Which one is your favorite? I'm partial to #2, myself. This Joan Didion essay will change the way you think about keeping a journal. "Keepers of private notebooks are a different breed altogether..."
"Ask Benedict to say the word 'penguin.' " Oh my, this is priceless. I love a man who can laugh at himself! Time management Monday: Just Don’t Do It. Fabulous advice. This is how I prune my To Do lists. Advice to writers: You can't write what you wouldn't read. Brilliant advice from Queen Nora. The LIE TO ME ebook is only $2.99 until tomorrow! Dirt cheap, y'all—less than a latte, and maybe provides a little more adrenaline. 10 of you can win a copy of THE SIXTH DAY from Shelf Awareness! Throw your hat in the ring on this one. That's it from me. Y'all give a treat to the neighborhood cat, send a just-because card to a friend, and we'll talk again soon. I had a life-changing experience a few weeks ago. I was golfing with my dad and our neighbor Mike, and I can’t remember the last time I played so horribly. Unfortunately, this isn’t a one-day phenomenon. I’ve been playing terribly for a few months. My game is off. My tempo, my swing, everything is messed up. Some people call it "getting the yips," but this feels deeper to me. Which of course makes me play even worse. I’ve attributed it to several things: I’ve lost weight over the winter, so my center of gravity is off. My surgically repaired (x5) shoulder is looser than it used to be. I am not playing enough. I’m distracted by work. You know, all the usual excuses one makes, especially in the middle of a lousy round of golf. Justifications. My dad’s been my coach from day one, so he was giving all kinds of advice — slow down your swing, keep your head down, you’re taking the club back too far — words I’ve heard from him so often I essentially block them out. I was growing more and more frustrated when Mike drove up in his cart. This is a paraphrase, but it’s damn close to the exact words. I live with a former baseball player. I’ve heard the adage “homers don’t win the game, singles and doubles do” ad nauseam for 25 years. But I don’t think it truly sunk in to me until Mike pointed it out. I was swinging for the fences on every pitch. And as such, was winding myself up too tight, and missing the ball. Mike drove away in his cart. Meekly, I took a six iron, advanced the ball, and a few holes later, started to get back in a groove. I didn’t have a ton of spectacular shots, but I also got to the green, got the ball in the hole, and moved on without too much fuss. I was embarrassed that I was playing this weird game, instead of my usual bombs toward the green, but it worked. My dad and I talked extensively about Mike’s comment for the rest of the round. I recognized an intrinsic truth in Mike’s words — I was trying too hard. Daddy pointed out that golfers in general play to the shot they know they can make. For example, I can hit a pitching wedge 100 yards. I know this. But 80% of the time, when I’m at 100 yards and I pull out my P, damn if I don’t leave it short. Just because I CAN hit it 100 yards doesn’t mean I’m going to do it successfully every time. I’m better off moving up a club, taking a 9, and getting it there. But do I do that, even knowing that’s the right play? Often times, no. Because damn it, I can hit the freaking P 100 yards. Now, apologies, because there’s some technical stuff in there about my equipment choices, which does play a role in my escapade: I didn’t have my clubs with me, and the club I would normally take for that particular shot wasn’t an option, so I was substituting. But… allow me to again draw your attention to one sentence in Mike’s advice. Four words. Four words have reframed my entire existence. Yes, this brief moment of advice truly helped me reframe my game that day. But it’s also helped me face a few major issues in my life. Once I had this concept in my head, I started looking around at my everyday. I was surprised by the insight it gave me. I spend my life on afterburner. * I go fast and hard and I expect everyone around me to keep up. I swing for the fences in everything I do, all the time, in every aspect of my life, be it sports, writing, publishing, love. It’s the reason I’ve had the successes I’ve had despite sometimes adverse conditions. It’s also bloody exhausting. There are a hundred examples I could give, but for brevity’s sake, let’s stick with my job. I can write 10,000 words in a day. But just because I can doesn’t mean I do. Thing is, if I don’t, I feel guilty. Even knowing that writing is a marathon, that you succeed not by writing 10k a day but by laying down 500–1000 words EVERY day, I still feel like I’m somehow shirking my responsibility if I don’t hit that crazy goal — which, BTW, like the pitching wedge to the green from 100 yards, I only managed to do occasionally, certainly not every time I touch the keyboard (or wedge). That lack of word count bleeds into the rest of my day. I skip my yoga or a walk to get a few more words. Dinner isn’t made, laundry isn’t folded. Books aren’t read. So many things that I could accomplish with my day get shunted away because I HAVE to get that massive word count. This is not a healthy way to approach a creative life, just like trying to get to the green with every shot isn’t sustainable if I ever want to improve my game. I think I’ve finally wrapped my head around how I turn my writing day into something that mimics the people I admire — Catherine, of course, John Grisham. They get up, they do their words, and then they go live their lives. I’ve said before I want to emulate this, but it wasn’t until now that I truly understood how to make that work for my supercharged brain. I know I can rather easily hit that 1,000 words a day goal in a couple of hours of true concentrated work. So I’ve set some new goals for myself, and they include being satisfied with that 1,000 words. Proud of it, even, instead of shaking my head, knowing I can do better. And I’m shooting to get them by noon, so I can then live my life instead of chaining myself to my laptop and guilting myself into writing more. That way, if I want to write more, I can. And if not… so be it. I’ve done my work. But the how… I’m going to save swinging for the fences and running on afterburner for the moments it’s actually needed, and spend the rest of my time with the dreaded 6 iron in my hand, swinging gently, and just moving forward. We’ll see how this goes. It should be an interesting experiment. Have you gotten any great advice lately? Share it with me in the comments! Oh, 2017. You will go down in history as one of my most exciting, crazy, thought-provoking, and frustrating years ever. After purposefully pulling back from external commitments, 2017 is the year I give my art my full attention again by staying home and working on my writing habit. Consistent writing brings me great contentment, and that is my goal for 2017 — contentment through consistency. This applies to more than just writing; it is my personal goal as well. Staying home allows for regular habits to grow and thrive — not just writing, but yoga, golf, friendships, minimalism for the house, and lots of regular, protected deep work time. This deep work practice will create great flow, allowing me to focus and challenge myself in my work. When I read this, I started to laugh and wrote Ha—not even close. But... as I thought about it, while I wasn't able to stay home and nest all year, pouring out words as quickly as I do my morning tea, I do believe I achieved my goal of contentment through consistency. I'm rather surprised by this revelation, as I spent weeks on the road this year, had my schedules shift around several times, ran around with my hair on fire meeting new deadlines, remodeled the house, and otherwise spent a lot of time freaking out. And yet... The crazy remodeling of several rooms to make them exactly what we wanted resulted in us decluttering the house to the point of austerity—a long-time goal achieved. It feels so good now. Another goal met: I spent a lot of time with the people I adore the most—friends, family, and business teammates, at home and on the road—deepening those relationships. With all the chaos, I managed to meet all my deadlines, read almost 80 books, took an actual unplugged vacation, wrote 275,000 fiction words, launched an anthology and recruited another, taped 6 episodes for A Word on Words, and found a comfortable writing habit. I even lost ten pounds in the process. Maybe I didn't fail as much as I thought I did! Then again, my golf handicap did go up because I only played 8 rounds this summer. 8! This must change. Well, everything and nothing. Professionally, the year-long campaign for LIE TO ME was a massive success. The book was a big hit, and allowed me to travel all over the country, meet a lot of readers, and put me on the radar of some very influential book bloggers and Instagrammers. My publisher got behind me big time, with major future commitments, and really, you can’t ask for anything better. Catherine and I wrote a new book that I think is wildly unique and fun, I finished a new standalone novel that is dark and different, wrote some short stories I’m very proud of, and grew Two Tales Press to its next level. Assistant Amy worked her tail off all year to allow me more margin for creative work, and when you see the numbers below, you’ll see exactly how well that worked. Personally, I found a great deal of contentment toward the end of the year once all my deadlines were met. The changes to my schedule and focus worked well, and I absolutely love my new interiors. I nearly exceeded my writing goals, nearly met my reading goal, and had a very good year in general. I committed to handling the holidays early and did, which brought a surprising amount of joy. Like so many others, the holidays are sometimes hard for me, but this year, having everything dealt with Thanksgiving weekend allowed me to enjoy instead of fret. So there’s the key — planning, and executing the plan. Who knew? I also asked for and received an Apple Watch for Christmas. I can already see how this tool is going to be very useful in helping me meet my physical goals this year. I am so excited by it — it’s very clever, and I was able to import all 5 years of my Fitbit data using a cool app, and can track my sleep, too. Winning! I also upgraded my laptop to a Mac Touch Bar, and I LOVE it. The keyboard alone is worth the price. So much better ergonomically. We also did a great job decluttering, emptying closets, turning the bonus room back into a game room instead of using it for storage. We have no house projects on the horizon; it’s time to settle into our bones and enjoy what we have. If I say everything and nothing again, you’re going to smack me and call me dramatic. You know the saying, still waters run deep? That was this year. On the surface, everything looks stunning. But trust me when I say there was a lot of behind-the-scenes chaos, fear, freakouts, emotional collapses, self-doubt, and just plain too much to handle. Were it not for the support of friends, family, teammates, a very compassionate husband, and a brilliant assistant, I would have run away to a little town in Europe and not looked back. It’s interesting, I seem to have a cycle going. Every few years, I lose it completely and struggle for a couple of months to find my footing again. Why is this? Perhaps because I take on too much and it all catches up at once, perhaps I care too deeply about the work and am holding on to it too tightly, perhaps the natural physical changes as I’m growing up affect my emotional state (chick hint: it does). A combination of all these things? Regardless, I’m committed to lowering my stress levels in 2018. Something has to give. I don’t know what yet, but to start, I have canceled all travel and conferences save two I’d already committed to. I really need to step back and take a breath so I can focus on my work. 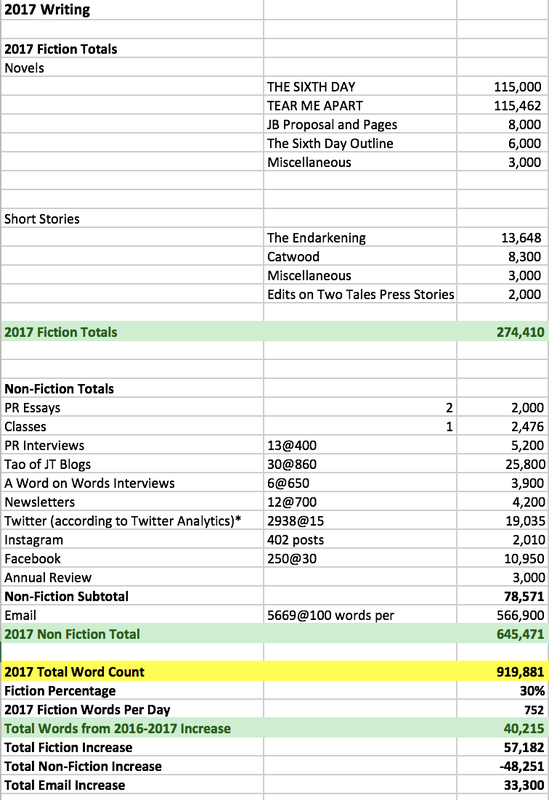 The most important takeaway from the 2017 numbers is this: my fiction total went up by over 57,000 words, and my non-fiction dropped by 48,000 (as compared to 2016). That in and of itself makes the year a raging success. I’m back into my 2013/2014 output levels, which means I can stock my magic bakery with more titles, and I’ve converted non-fiction words into fiction words for the very first time. A very good thing. 2017 was an insanely good year for my creative work. So many great things happened, some of which I can’t even talk about just yet! I released three original titles: THE DEVIL’S TRIANGLE with Catherine Coulter, my second standalone, LIE TO ME, and my first anthology under my Two Tales Press imprint, DEAD ENDS. I wrote and published two short stories: CATWOOD and THE ENDARKENING, and started two more that will come out in 2018. THE DEVIL’S TRIANGLE hit #2 on USA Today and The New York Times, and #1 on The Wall Street Journal. It received a starred Booklist, too. LIE TO ME hit The Globe and Mail and Toronto Star top ten lists, received a starred review from Publisher’s Weekly, and continues to do well. Target chose NO ONE KNOWS for their Emerging Author shelf, and LIE TO ME as a Target Select Read. FIELD OF GRAVES was nominated for a RITA® Award for best Romantic Suspense, and both NO ONE KNOWS and FIELD OF GRAVES were long-listed for the Southern Book Award in the Thriller category. I went to ALA and BEA in support of LIE TO ME (OMG, that banner! ), as well as toured all over the west coast, which was a blast. And of course, a huge exciting highlight of the year, A WORD ON WORDS won a regional EMMY®! And I managed to throw in another standalone novel, that I’m revising now, which will be my 2018 solo release. It’s time to apply all the changes I’ve made over the past several years into a single, overarching habit that encompasses my work, my current life, and my future work. Putting my own needs first will allow me to grow both as a writer and as a person. Being selfish with my time, only applying my energy to work I love and believe in, will help me reconnect with my creativity in new and exciting ways. I vow to try new things, to read new-to-me authors, to regularly unplug and decompress, and enjoy life without pushing so hard all the time. Most importantly, I will set work hours, and step away from the screen when the day is done. “Mischief Managed” will be my new end-of-workday mantra, giving me permission to shut down until the next day. A shutdown ritual coupled with an 8-week modular work plan will lend structure and cohesiveness to my days, and drop my stress levels exponentially. I’m not even pretending to have a zen word for this year. 2018 is going to see some serious life changes for me work-wise, and I intend to shift several of my personal goals as well. I’m closing in on a major birthday in 2019, and I want to lay the foundations this year that will carry me through middle age (gulp). This includes the usual culprits: exercise and weight loss, a sustained yoga practice, and more vegetables than meat. And golf is a priority. But this year, I’m going deeper than changes to my physical being. I want to change how I approach my creativity. I feel like it gets stifled with all the pressure that exists in our current environment. I stepped away from social media several times in 2017, and this will continue into 2018. The psychic cost isn’t one I’m willing to pay anymore. I’ve found a comfortable pace with my networks, and my focus is on deepening those relationships instead of trying to grow, grow, grow. I’ve always said quality is more important that quantity. 2018 is the year I prove that to myself. I want to push myself creatively, too. You’ve heard the term “leveling up” — well, I want to find a way to be focused enough to level up every book instead of every five to ten books. That’s going to take an overhaul of my systems. Deep work is paramount, no distractions, no panic. I've learned how to say no when something doesn't enhance my life or work, and will continue to do so. My daily habit is in a good place, reinforced by scheduled Freedom sessions: Read during breakfast, write from 10–12, read during lunch, write from 1–3 (or 2–5 depending on the day), then a workout. Dinner, read or TV. Wash, rinse, repeat. I want to read more and consume less. As always, I want to read more of what I already own instead of buying new books. I want to read with intention, work with joy, and put myself first. I want to continue mentoring, continue broadening my horizons with A Word on Words guests, and dig deep into my mental wellbeing. I also ran across a very cool concept recently about breaking the year into multiple 8-week segments. The idea is 6 weeks of deep work, 1 week of wrap up, 1 week of vacation/rest. Looking at my word trackers, I do something very similar to this already—the bulk of my books are almost always written in the last 6 weeks of the project’s timetable. I spend the first 8 weeks or so on the first 25,000 words, making the set up works perfectly. I will be analyzing this new method and applying it to my annual creative planning, and see where it takes me. Plus, that week of rest is paramount. I took a real vacation in 2017, and I need to do it again. As far as work plans: I want to write three short stories, and finally wrangle the non-fiction project I’ve been circling for the past several years, which means instituting a non-fiction day every week. I’m choosing Fridays, to echo my many years blogging at Murderati. Catherine and I will be writing the sixth Brit in the FBI, which is due in late summer, and I will tackle another solo book. I'm not sure if that's a standalone or a Taylor/Sam yet. I might toss in a secret project if I have the time and energy. I have three original releases this year: THE SIXTH DAY, A Brit in the FBI #5, comes out on April 10. TEAR ME APART, my new standalone, releases on September 18. And we have a cool new anthology coming from Two Tales Press in November. I can’t WAIT to tell you all about it. There’s even more incredible news to share, projects that will be taking my creative time, and I will release those details as soon as I’m able. Exciting times ahead! Honestly, I don’t know that I ever imagined my career would be humming along like it is. I am blessed, and I know it, and so much of that is thanks to you. All in all, I’m faced with an interesting moment in my creative life. I hope I can meet it with aplomb, meet my new goals head on, and accomplish a lot. Thanks as always for being a part of my journey. Many blessings for a splendid, productive, happy, and safe 2018. Peace out! For the past several years, I’ve been doing annual reviews of my life and work, based on the format from Chris Guillebeau’s wonderful Annual Review on his blog, The Art of Non-Conformity. Chris’s system is exceptionally detailed, more so than I really need, but the gist is there. It’s a great system for those of us who are self-employed and want to do an assessment of our work for the year. Here’s the link to the actual post. Go on over there and take a read. I’ll wait. And if you're interested, here are the links to my previous annual reviews for 2009, 2010, 2011, 2012, 2013, 2014, 2015, and 2016.